Winner Poker is part of the iPoker Network, one of the largest and fastest growing poker networks on the web. The benefit to the player is that you rarely, if ever, will have trouble finding a game to your liking, whatever your game may be. They offer Hold’em, Omaha, Omaha Hi-Lo, 5 Card Stud and 7 Card Stud. Of course the vast majority of the action will occur at the Hold’em tables, with Omaha coming solidly in second and the rest will generally have spotty action at best, especially at higher stakes. They also have Sit&Go tournaments running around the clock and Winner Poker offers some great multi-table tournaments as well. The participate in the ECOOP, the European Championship of Online Poker, which is a large online tournament series offering some incredible guarantees, including the $1.5 million guarantee final (for ECOOP V, December 2009). You can also turn your points in for a cash reward. The more points you have, the more valuable they become. As you can see, this is a very generous program and there is a definite benefit to playing as much as possible and moving to the next level. They also have a great calculator available on the site that can estimate how many points you would earn per month if playing at certain levels. For example, a 6-max no-limit Hold’em player, playing 6 tables at a time for 20 hours per week at the $.50/$1 level could earn over 625,000 points. That’s enough for a monthly $700 bonus right from the first month, as well as a $10,000 bonus at the end of the year. The $700 monthly bonus would also move up to $850 around October. That’s a great VIP system that is going to be hard to beat pretty much anywhere! The software at Winner Poker is very good, stable and user friendly. The lobby is laid out quite nicely, with your choice of game on the left hand side. You can narrow down your search by type of game (ring, Sit&Go, etc. ), then by the actual game, such as no-limit Hold’em or pot-limit Omaha, and then further by stakes. It’s a very good system that makes finding the right table quick and easy. One thing that is somewhat unique and quite helpful is that when you are looking for ring game, the right hand side of the lobby will show who is on the table when you click on a particular table. That in itself is not completely unique, but what is different is that at the bottom of that screen (where it shows the players on the table) it shows the total amount of money on the table. Just another little detail that can really help in table selection. Every player at the table is required to pick from one of 10 set avatars, including the likes of a cowboy and a balding man in a Hawaian shirt. None of these characters are especially attractive, but they do add a little visual flair to the action. The actual felt is very clean and clear and all bets and cards are easy to make out. When its time for you to act, the buttons that pop up are also simple to read and use. To help speed up your play, Winner provide a small row of buttons that let you jump the bet slider to 1/4, 1/2, or full pot, as well as all-in. Chatting at the table is a feature almost every room supports, but on Winner, every time someone enters something in the chatbox it appears in a bubble above their avatar. As well as making it easier to keep track of who’s saying what, this unique addition makes it feel more like a live game. Migrating from televised poker games is the win percentage. When everyone in the hand is all-in, the chances of each player winning are displayed as a percentage beneath their hand. 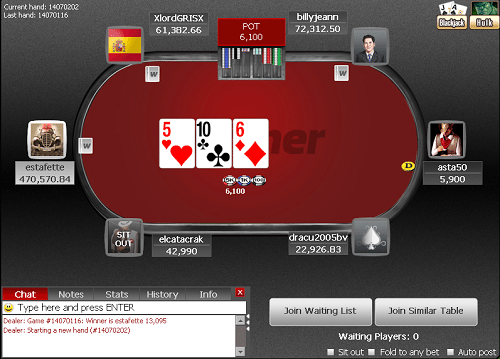 As part of the iPoker Network, you can rest assured that Winner Poker will have more than its fair share of action. One thing about sites on larger networks like this is that you can use really proper table selection to be sure that you’re on a great table and in position to win money from the weaker players. There’s no doubt that you’ll find more players playing no-limit Hold’em than anything else. That’s not to say that there won’t be plenty of action at the other games though. Omaha especially seems to be up and coming pretty much everywhere and iPoker is no exception. There are usually plenty of tables running, especially at lower levels. As you move up above $2/$4 it will be harder to play multiple tables or to table select at all, but it’s not impossible. Overall, there’s plenty of action and plenty of dead money on this site. Combined with the bonuses and VIP Program, Winner Poker is an option definitely worth looking at. Large network + great promotions = plenty of fish. The equation holds true here! 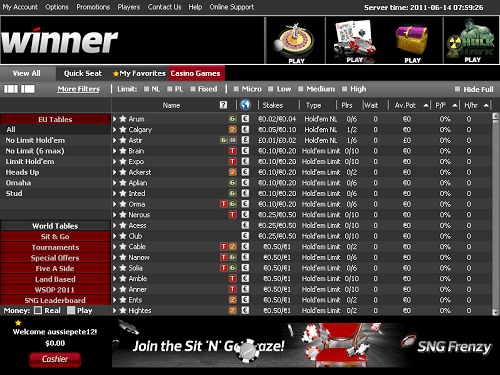 The iPoker Network is well known for have a huge amount of weak players. Sure there will be plenty of solid, winning poker players here, but with just a little table selection, there’s little doubt you can build a solid winrate playing against a number of fishy players. Winner Poker has a great VIP program and combined with other promotions and the amount of poor play on the network, it’s a must-play site. Winner Poker offers all new players a 250% Sign-Up Bonus worth up to €1,500. All you need to do is use bonus code FTR when signing up and making your first deposit. Then just make a deposit and you will receive a 250% bonus up to €1,500. That’s alot of cheeseburgers! Clearing your bonus is as simple as playing in real money games at Winner Poker. Every time you participate in a cash game or tournament you will be awarded points, based on the rake or the tournament fees. 16.875 points are awarded for every €1 in rake or tournament fees paid while you’ll get 20 points for every £ taken in rake or fees. Players must earn 473 points for every €5 in bonus, which is released in increments of €5. So to earn a full bonus of €1,500, players must earn 141,900 points. The bonus will be tough for even a serious grinder; however, you will have 90 days to earn as many €5 chunks of it as you can. Thus even microstakes players are likely to unlock at least a few portions of the bonus. As a new depositor, you’ll gain entry into the $250 Weekly Depositors Freeroll. Other promos include the Top Hand of the Day, which awards $100 to the best hand at the tables every day, and a $250 Bad Beat Bonus for when your four-of-a-kind kings or better hand fails to hold up at showdown. Winner Poker also offers a free $10/€10 to newly registered players who verify their account by SMS. In order to take advantage of this offer, sign up using our links, download the poker client software and the mobile app, and create a new account. You’ll then receive a PIN code by SMS that you will need to enter in lieu of a Winner Poker bonus code to get your free money. This freeplay is restricted to special tables until you pay €10 in rake/fees, after which is can be used at any tables or withdrawn. These restrictions are waived if you make a deposit to your account. Support at Winner Poker consists of email, toll free phone numbers and live chat. Live chat is reserved only for registered players to keep the wait lists down, so you can expect to reach an operator in short time. The support is quite good, quick to answer questions and very helpful.